Today is the last of three classes up front of contextual material - material that will be useful as we read parts of Genesis later. The first two were the history of the people of Israel from Abraham all the way to the time when Alexander the Great captured Canaan and the rest of the Ancient near East, and the summary of learning's from the Ancient near East. 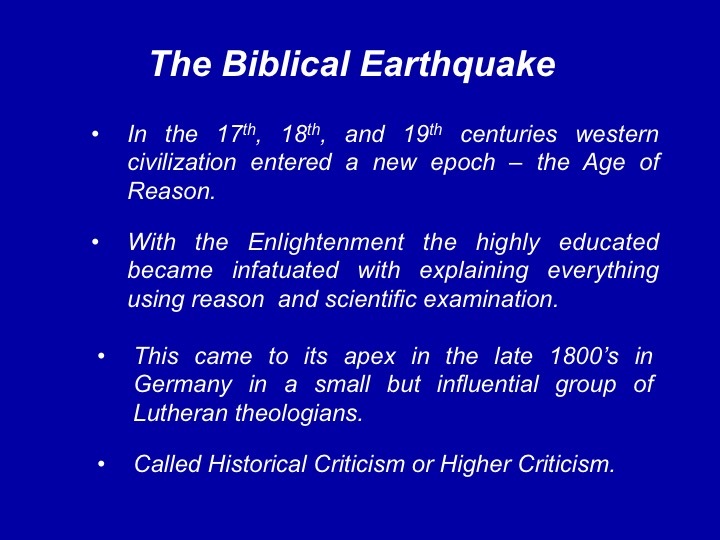 Today we are going to talk about one of the biggest seismic shifts in biblical interpretation in bible history – the 18th and 19th century movement called Historical Criticism or Higher Criticism of the Bible. This happened before any of us were born – in the late 1800’s, and as a result many modern Christians are not aware of what it was all about and how much it shook up biblical studies. 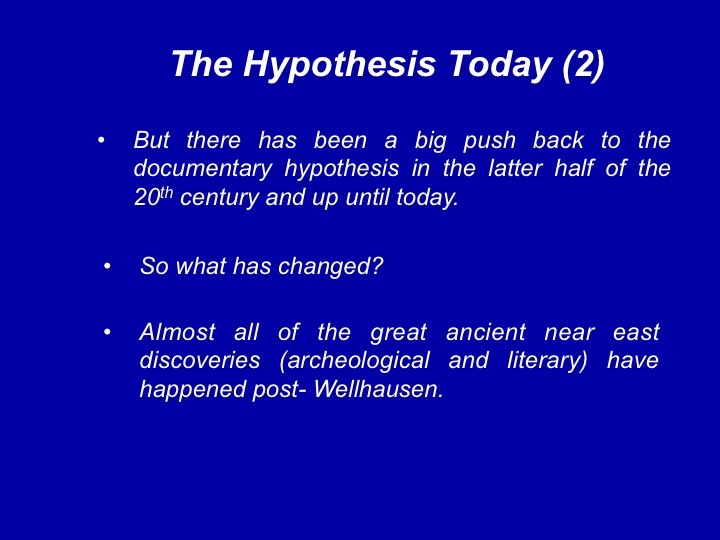 One of the big things that came out of Higher Criticism was something called the Documentary Hypothesis. And I think it is important that we understand it well before we continue the rest of our reading of Genesis. 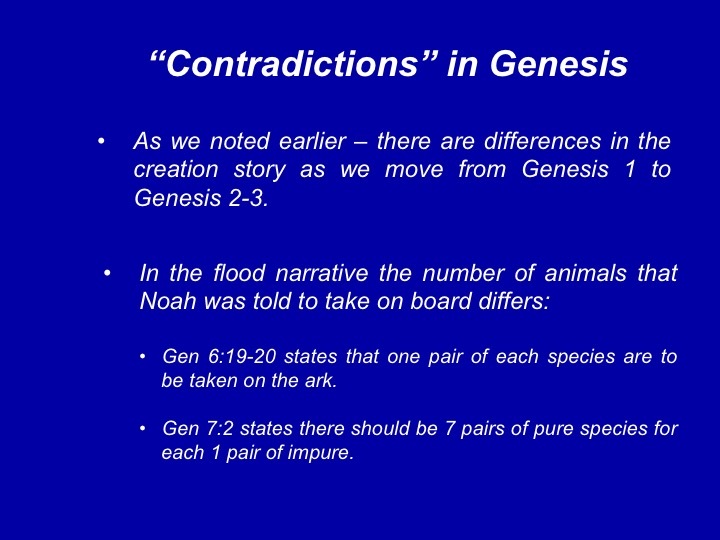 Contradictions in the creation narrative. Contradictions in the flood narrative. 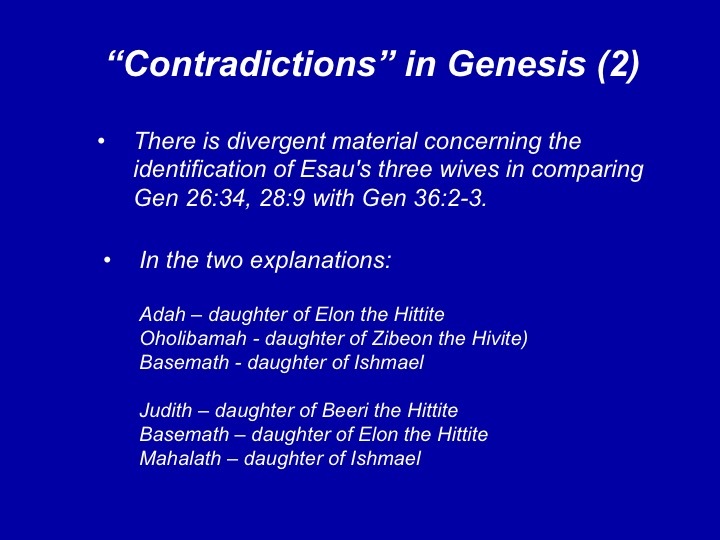 Contradictions in the identification of Esau’s wives. 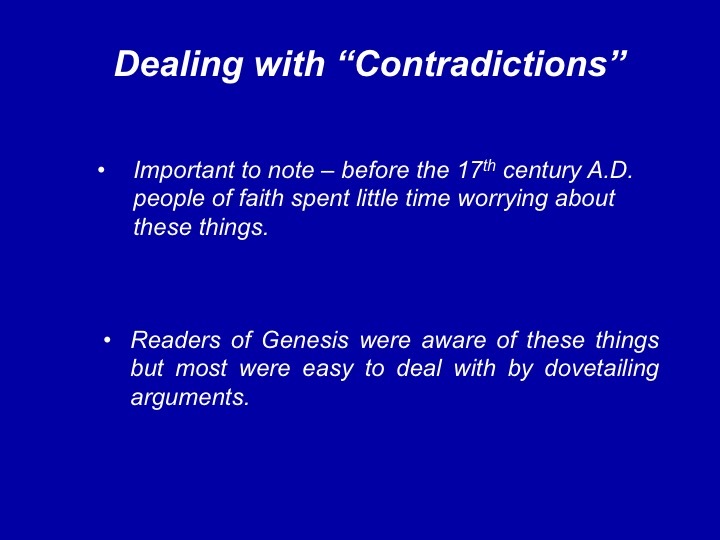 It is important that we note that despite the fact bible readers were aware of these apparent contradictions for at least 1000 years there was very little concern about them until the time of the Protestant Reformations. Most of them could be handled by some simple arguments known as dovetailing arguments. 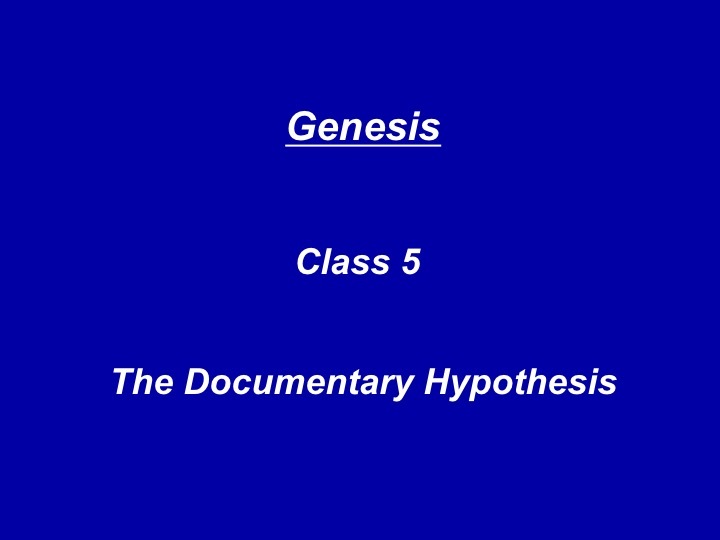 For example any differences between Genesis 1 and Genesis 2-3 were explained in terms of Genesis 1 being a cosmos centric description focused on the creation of the cosmos – earth, sky sun, moon, stars etc. 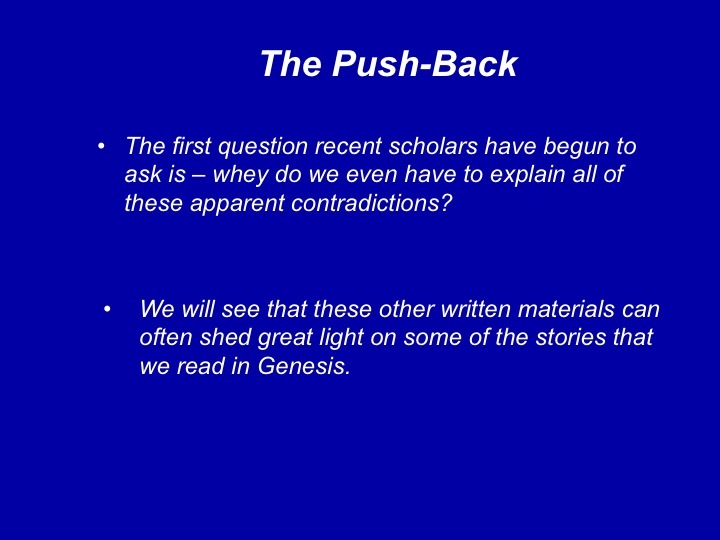 And Genesis 2 then assumes those things already exist - and does not discuss them but moves into more detail about how man and woman were actually created and their subsequent behavior – this was the more earthly description. Or in the case of two different instructions for how many animals to take onto the ark. The seemingly straightforward explanation was that the first instruction was very general – be sure to take every species and the second and later instruction was the more specific one of taking 7 pairs of the pure for each impure species. They basically said that the Torah was written by a number of human authors and it was not appropriate to assume that it was all divinely inspired because there was no scriptural basis for that. This was kicked off by a French humanist named Jean Astruc who published a book in which he listed all of the verses that used Yahweh vs the ones that used Elohim. He was unwilling to step away from Moses at the author so he suggested that there were two sources for the Torah and Moses used them to write the Torah. 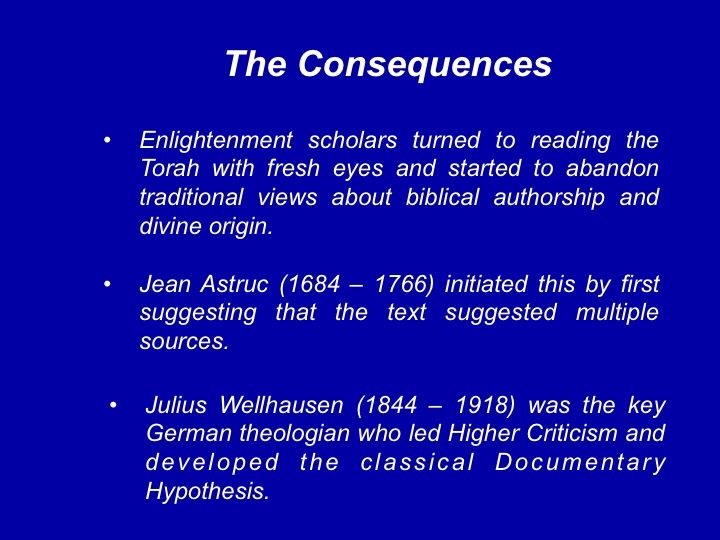 Wellhausen posited that four separate sources were brought together to create the Torah. In Wellhausen’s formulation the four sources were each coherent and logically consistent, but the redactor had no interest in producing a document free of errors. Or in other words the redactor was a very poor editor. Now – we are going to critique in a moment whether this hypothesis still makes sense but let me mention at this point that no evidence was found for these four sources. Not even a fragment has been found. Wellhausen asks that we take their reality on faith. Every writer is a product of his time and place – it sets his worldview. In this case for Wellhausen the social and cultural background of 19th-century Germany influenced Wellhausen' s reconstruction of the development of the sources of the Torah or Pentateuch. He was a Protestant (Lutheran, specifically), and from his writings we know that he was strongly anti-Jewish and anti-Catholic biases led him to date D and P after the time of the classical Prophets. 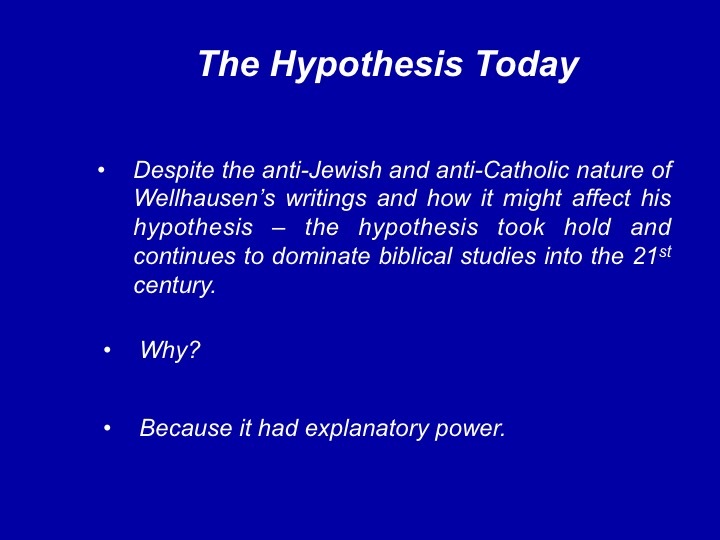 Wellhausen dated J and E early, because they are essentially the basic narratives of ancient Israel, devoid of any overriding theology. Wellhausen saw the Prophets, dated to the 8th century B.C.E. (the time of Amos, Hosea, Isaiah, and Micah), as the earliest expression of ancient Israel's religious thought. The Prophets emphasized ethics and morality, the aspects of religion most heavily emphasized by German Protestants. 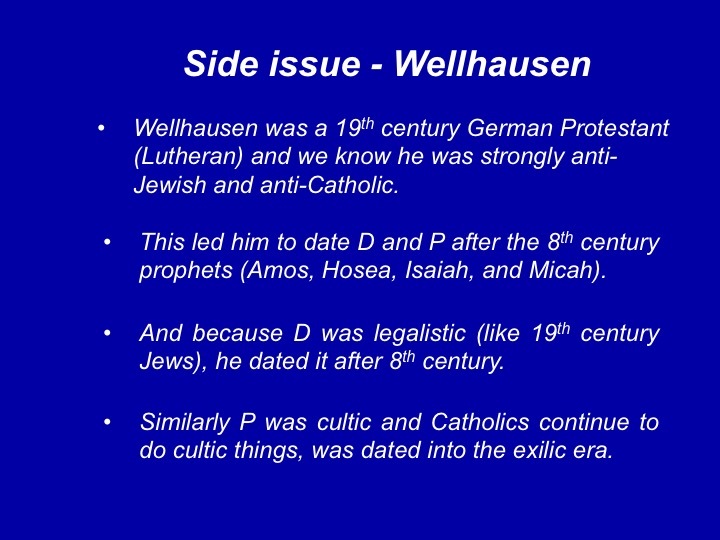 Because D is mostly legal in nature and Jews continue to uphold the laws of the Torah, Wellhausen dated D to after the Prophets and viewed the legal tradition as a downward tum away from the religious ideals of the Prophets. Similarly, because P is mostly cultic material and Catholics continue to re-create this worship system, with priests offering incense on an altar, Wellhausen also dated P to the late period, regarding cultic concerns as a downward turn away from the Prophetic ideal. The documentary hypothesis still dominates the thinking of many biblical scholars today. Chances are every pastor that you have heard as a Presbyterian has been exposed to the documentary hypothesis in their seminary training. It is even taught to Catholic and Jewish scholars. What do we mean by explanatory power? Every apparent contradiction we talked about is neatly explained away by this hypothesis. Because it was designed to do that. Whenever Wellhausen encountered an apparent contradiction he simply assigned the first instance to J and the second to P. When he finished doing that essentially everything was explained. Now I want to emphasize that there is still not an alternate hypothesis that has commanded attention. And until there is it will continue to be the leading hypothesis. The first question recent scholars have begun to ask is – whey do we even have to explain all of these apparent contradictions. What we may perceive as contradictions in an ancient text, as a result of our notions of rational logic, may not have been perceived as such by the ancient authors and readers. That is to say, the literary style in antiquity had its own narrative logic, which does not necessarily mesh with ours. How do we know that? Because of all of the ancient near east literary texts we have found all exhibit apparent contradictions. That includes Mesopotamian, Egyptian, and Canaanite literature. 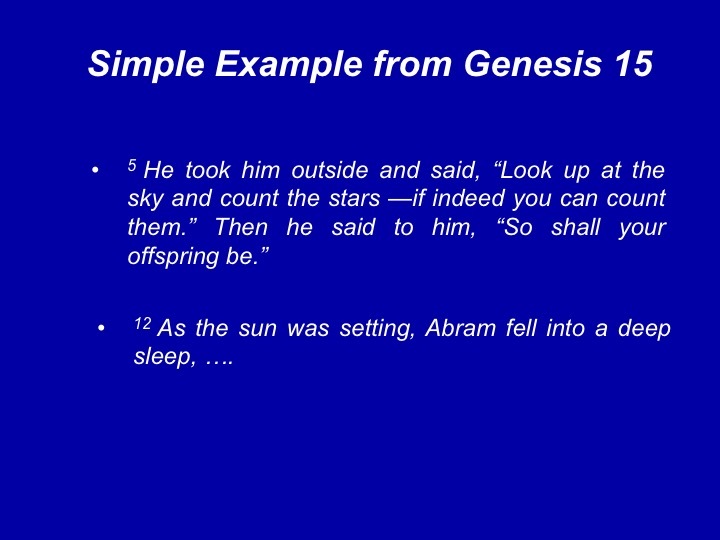 For example, in Genesis 15, first God tells Abraham to look at the sky and count the stars, for as innumerable as they are, so will be his offspring (in verse 5)-then the sun sets in verse 12! By our standards, this is totally illogical, but based on the norms of ancient narrative logic, no problem is present. 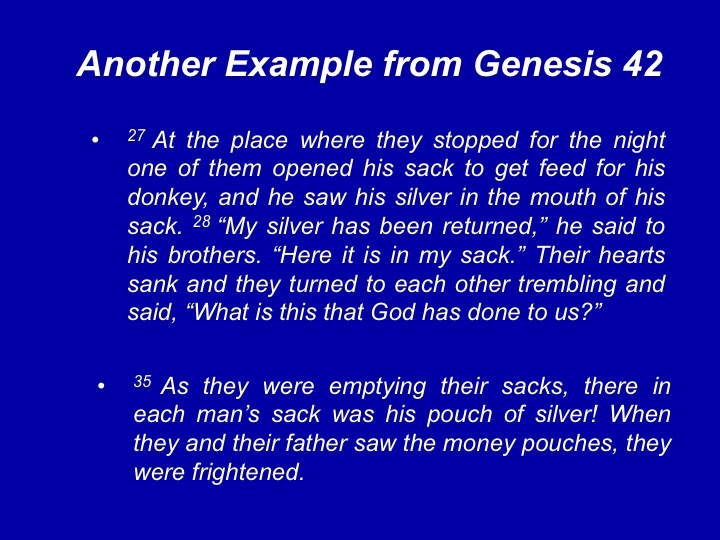 As another illustration, twice in Genesis 42, Joseph's brothers discover the silver in their bags and react with equal fear and trembling, first in verses 27-28 at an encampment on the way back from Egypt to Canaan, then again in verse 35 when they are telling Jacob all that transpired on their mission. Clearly, the brothers could not have been surprised by this discovery the second time! Yet once more, we must assume that such storytelling is in line with the norms and expectations of ancient narrative logic. 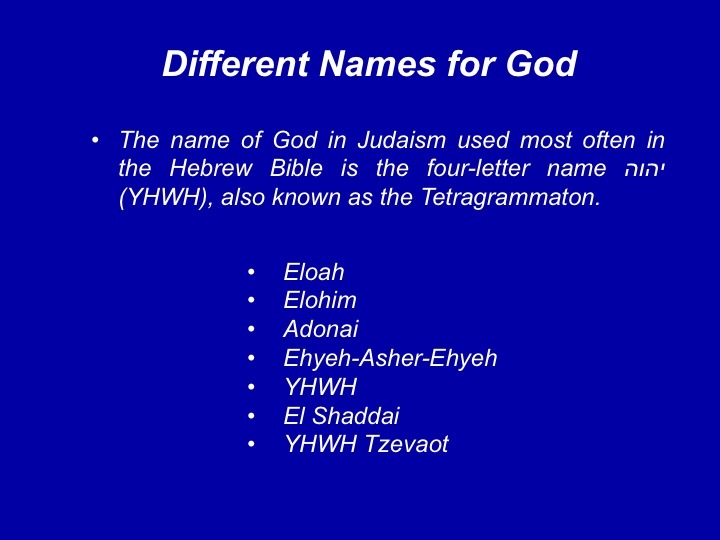 The name of God in Judaism used most often in the Hebrew Bible is the four-letter name יהוה (YHWH), also known as the Tetragrammaton. 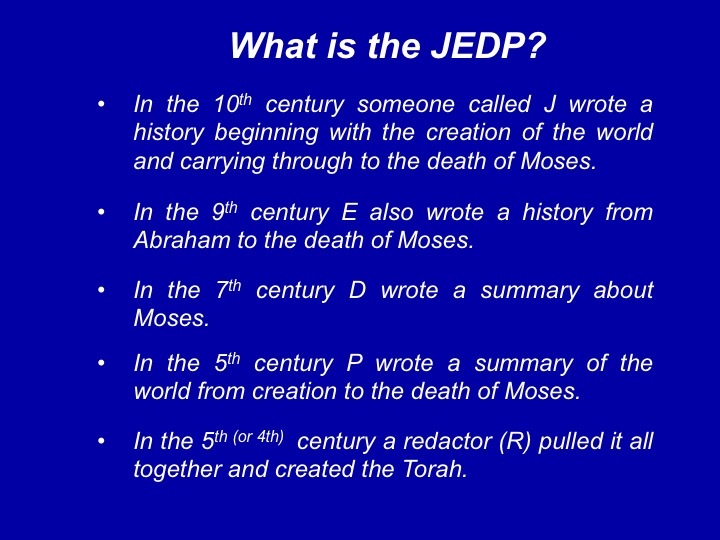 The dates of the JEDP theory are all wrong, especially for the last two sources, D and P. Linguistic analysis demonstrates that the entirety of the Torah, and certainly Genesis, is composed in classical Biblical Hebrew, not Late Biblical Hebrew-the dividing point for these two strata is c. 550 B.C.E., in the middle of the Babylonian exile. All languages undergo change during their history, often gradual, but typically, there is radical change during and after times of political and social upheaval. (Note, for example, that Old English becomes Middle English upon the Norman conquest of Britain in 1066.) And thus it is with Hebrew, but the linguistic developments that one finds in the texts dated to the Exile and beyond are not to be found in Genesis. The easiest demonstration of this is the following: During the Persian period, loanwords from Persian enter the Hebrew language by the dozens, as can be seen by looking at the relatively short books of Esther, Ezra, Nehemiah, and others from that period. 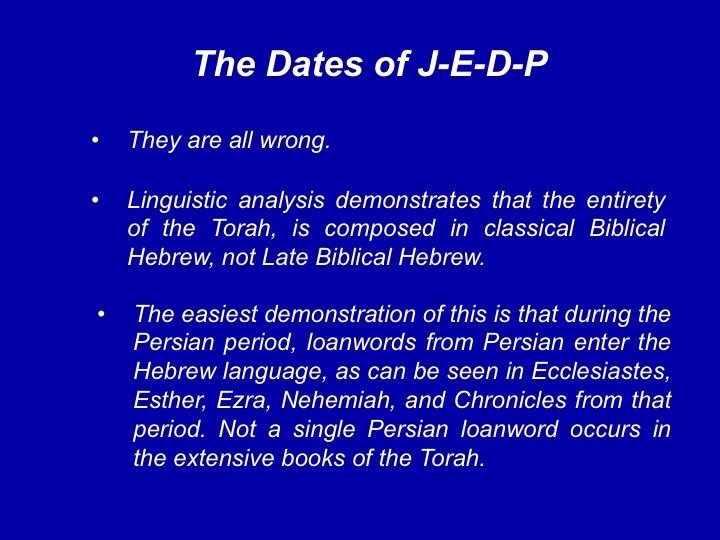 By contrast, not a single Persian loanword occurs in the very extensive five books of the Torah. A growing number of scholars are coming around to the belief that the material that Wellhausen called D and P was more likely written in the much earlier period of the monarchy of the 10th and 9th century, along with the narrative material of J and E. This has in turn raised a question whether these separate documents really existed. A new class of biblical scholars in the late 20th century have concentrated on the literary aspects of the Torah it is starting to pay off in terms of an increased understanding of the writing of these five works. By examining some of the things we talked about last week in looking at the corpus of work discovered in the ancient near east these scholars have begun to see books like Genesis and Exodus in a completely new light and realize that most of the narratives have been written in a way that makes most sense when read as a literary whole rather than trying to break it into sections subdivided into J, E, and P material and then thrown together by a redactor. These scholars have become the biggest critics of the documentary hypothesis. What they have seen is that the entire literary structure of the Torah has motifs and themes that cross the boundaries of the various sources described by the documentary hypothesis. 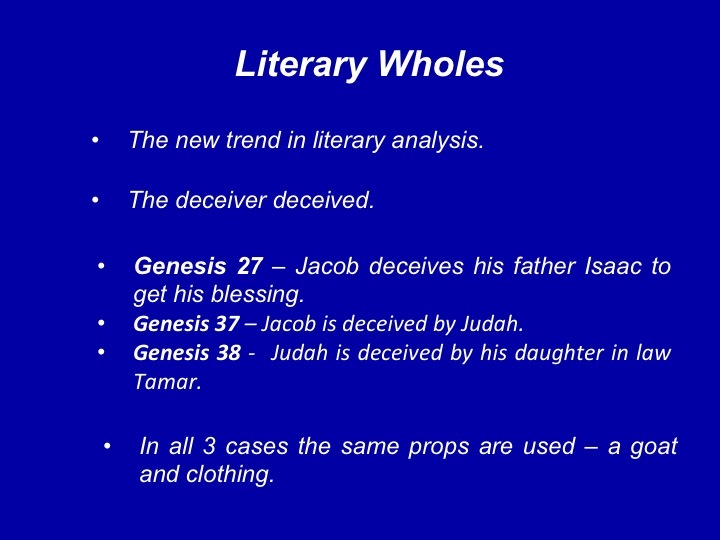 We do not have time today to get deep into literary analysis but I would like to finish by giving a simple example that illustrates this point and resounds throughout the book of Genesis and that is the motif of the deceiver deceived. As we get into the stories of Abraham and Jacob later in the lessons we see the importance of literary wholes more fully. 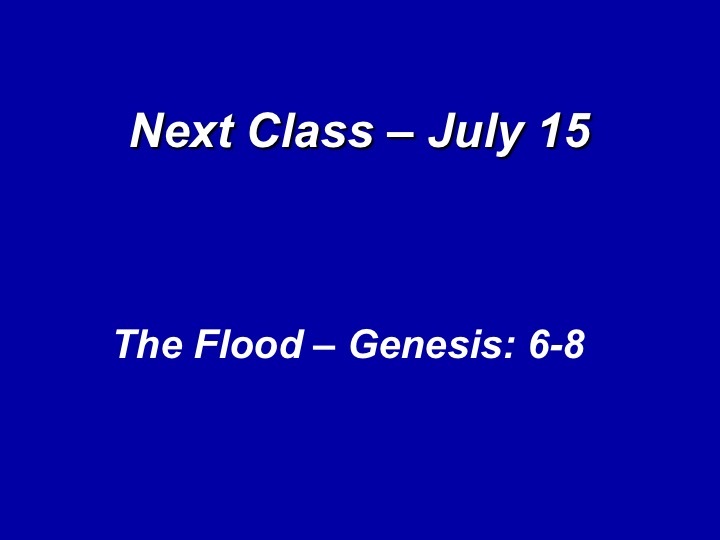 And speaking of finally getting back to reading Genesis – we will finally return to reading from the book of Genesis after three weeks of contextual material. And you are going to see the impact of reading it as literature.